The frequency of epilepsy occurring in patients with brain tumors is estimated at 30% or more (van Breemen et al. 2007) and is influenced by both the tumor type and location. Tumors extending into the frontal, temporal, or parietal cortex are more commonly associated with seizures. 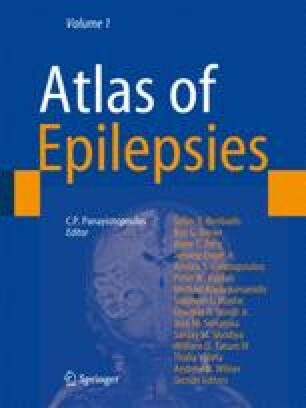 Slow-growing, low-grade tumors are more epileptogenic and often associated with seizures presenting in childhood or adolescence. These may become refractory to medical treatments but without causing other neurological deficits (van Breemen et al. 2007) ( Table 14-1). It is likely that epileptogenic activity arises in the adjacent peri-tumoral cortex, although the precise mechanisms are poorly understood (Greenfield et al. 2008). Seizures are often focal in nature and concordant with lesion site. Secondary generalization of seizures may occur. In some cases, the epileptogenic focus may be remote from the tumor site (van Breemen et al. 2007). Lillian Martinian, Sofia Eriksson; Dept of Clinical and Experimental Epilepsy, UCL Institute of Neurology, London for contributions to the images.